Lake Geneva Tennis is Now Open! Lake Geneva is ideally located in one of the fastest growing regions in the Midwest. The community is positioned less than an hour's drive away from the metropolitan areas of Chicago, Milwaukee, Madison, and Rockford. While some only know it as a summer vacation destination, Lake Geneva is also a thriving community of businesses making products for local as well as global markets. 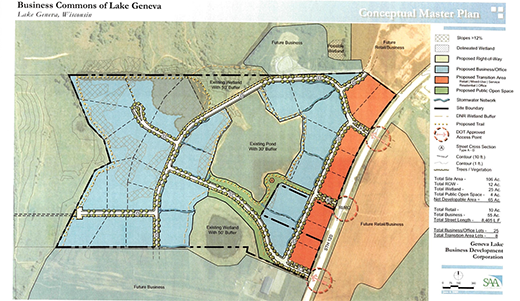 The Lake Geneva Economic Development Corporation (LGEDC) has purchased a 105-acre development site known as the Lake Geneva Business Commons. Located just south of Lake Geneva on Highway 120, this land is available for future area development. The Lake Geneva Business Commons has potential to be excellent development space for businesses large and small, needing more land on which to build. For more information on the LG Business Commons, please contact Andy Dammeir.